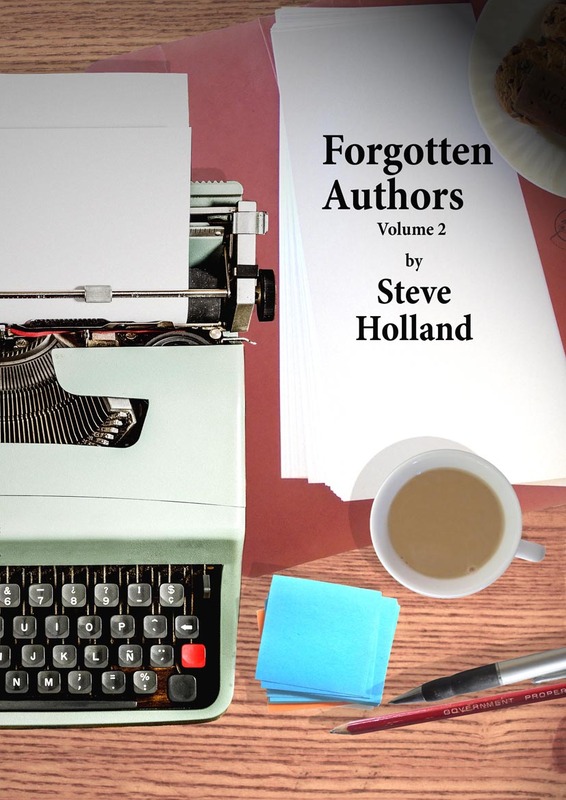 Freelance author and editor for the past 20 years. My interests are old British comics, books and magazines... and that's what you'll find here. I have some books on sale on Ebay. 19 April. 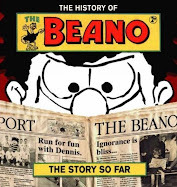 Jeremy Briggs has been delving into the history of comics that never made it past the dummy stage (first episode of five... just follow the links). 14 April. GCHQ have cracked Frank Sidebottom's secret codes. 7 April. A code-breaking computer named after cartoonist W. Heath Robinson has been reconstructed at The National Museum of Computing in Milton Keynes. Due to secrecy surrounding code-breaking, Robinson never knew the computer was named after him. 6 April. How the world went mad for Moomins. 4 April. Interview: Dan Abnett (video). 21 March. David Slinn recalls the short-lived newspaper supplement, Scoops. 21 March. Back in 2017, designs for futuristic vehicles by Frank Hampson were auctioned. 21 March. Philip Vaughan interviews Barrie Tomlinson and Ian Kennedy. 12 March. Wasteland Weekend is a Mad Max inspired festival held in the Mojave desert. Lots of Fury Road inspired cars and costumes inspired by the film's co-writer, Brendan McCarthy. 11 March. Duncan Jones describes his Rogue Trooper film script as "Guardians of the Galaxy had a baby with The Raid." 1 March. The Peter Hogan and Steve Parkhouse series Resident Alien has been picked up for a full series by Syfy. The series will star Alan Tudyk as a crash-landed alien on Earth. 27 February. Raymond Briggs' final book, Time For Lights Out will be published by Jonathan Cape in November. 20 February. John Freeman has produced a comprehensive overview of sales figures for the latter half of 2018. 8 February. Webchat: Neil Gaiman. 6 February. 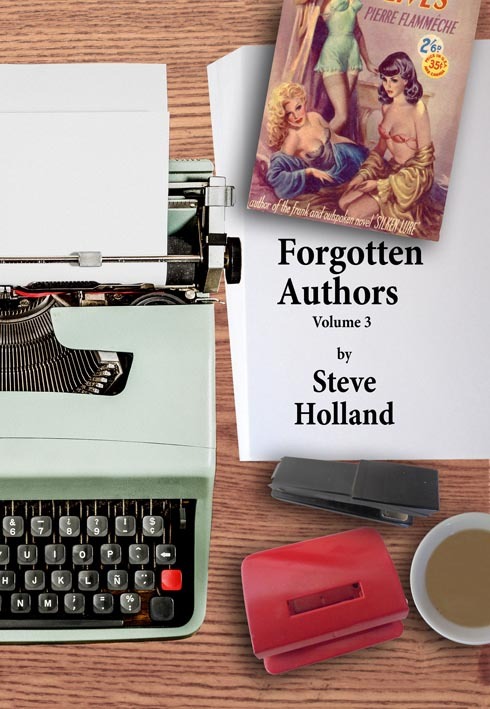 Interview: Steve MacManus. 3 February. Interview: Anna Morozova. 3 February. The National Portrait Gallery's photographer in focus is Steve Cook. 31 January. Jolly news for these snowy times - Rebellion are to release a 48-page Cor! & Buster Special on 17 April, featuring characters including Sweeney Toddler and Gums, drawn by the likes of Ned Hartley, Cavan Scott, Abigail Bulmer and Tanya Roberts. This will be followed by a reprint for Free Comic Book Day (4 May) entitled Funny Pages, featuring reprints from the archive. 31 January. 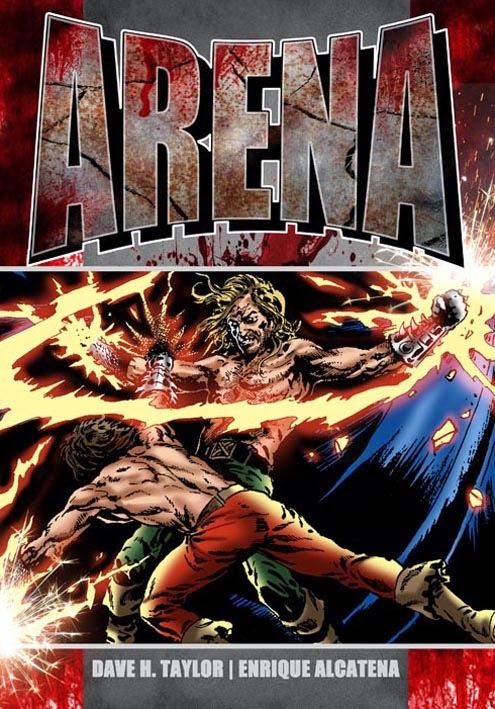 Lew Stringer is to write a regular column for ComicScene looking at comics through the ages. 8 January. Neil Gaiman will be presented with the Barnes & Noble Writers for Writers Award on 7 March 2019 and the Poets & Writers annual dinner. 1 January. Two programmes still on the BBC's iPlayer for the next few weeks: With Great Pleasure at Christmas: Neil Gaiman and Meil Gaiman's Norse Mythology. 29 December. The latest episode of 'Masters of Comics' features John McShane, kay player in Glasgow's thriving comics scene for four decades. 18 December. The Unseen Ron Embleton catalogue can be downloaded as a PDF. The exhibition runs at Messum's Art Gallery, 9 Jan to 1 Feb 2019. 30 November. 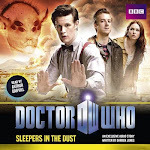 Interview: David Sutherland (steaming audio). 26 November. A graphic novel by Jack Gantos and Dave McKean due to be published in May 2019 has been withdrawn following protests of fear-mongering and Islanophobia. 23 November. Interview: David Roach (podcast). 15 November. Interview: David Hine and Mark Stafford discuss Lip Hook. 15 November. Rebellion has teamed up with the National Literacy Trust to distribute 10,000 of their new Roy of the Rovers releases. 14 November. Dave Gibbons' appreciation of Stan Lee. 9 November. A rare episode of the Radio Luxembourg Dan Dare radio series from 1953 has surfaced... and you can hear it here. 9 November. Danie Ware discusses her upcoming Judge Anderson e-book. 30 October. Interview: Barrie Tomlinson (streaming audio). 30 October. Interview: James Peaty. 30 October. The Isle of Man has issued a set of Dennis the Menace stamps in time for Christmas. 29 October. Judge Dredd Megazine will include a bagged tribute to the late Carlos Ezquerra. "Carlos' death was a profound shock, not just to everyone at 2000AD but also to his fans across the world," says editor Matt Smith. "This small collection of his stories shows not just his evolution as an artist but also a sense of his incredibly consistent quality over more than four decades." 27 October. The Guardian has an exclusive extract from Posy Simmonds' new novel, Cassandra Darke. Also an interview with Simmonds about the book. 26 October. Fanscene #2 can be downloaded for free from here. 24 October. How Neil Gaiman's Sandman universe is expanding. One of the staples of Eagle comic over its nineteen years was the cutaway. These fascinating and educational illustrations weathered the changes to the comic throughout the 1950s and 1960s, running with few gaps from an electric train in the first issue to a truck in the penultimate issue. 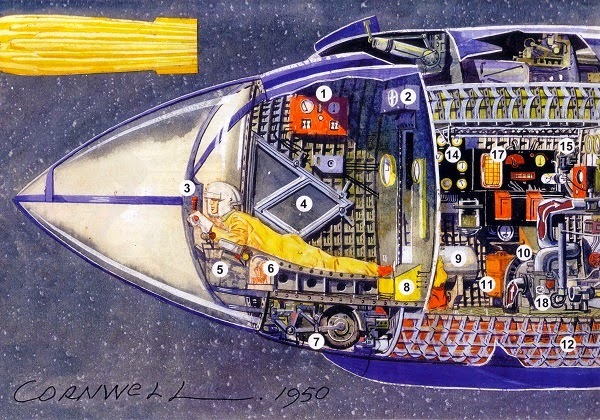 Both these cutaways were illustrated by Leslie Ashwell Wood who was by far the most prolific cutaway artist Eagle had, contributing almost two thirds of the near 960 cutaways published in the weekly title. While not all the cutaways are signed and therefore attributable to a specific artist, there were at least 23 artists other than Wood who contributed cutaways, from the familiar names of J Walkden Fisher with 59, Lawrence Dunn with 48 plus Geoffrey Wheeler and John Batchelor with 44 each, to the less familiar names of Brian Watson, T C Renwick-Adams and Alan Crisp who provided one each. One familiar name not normally associated with the Eagle cutaways is Dan Dare artist A Bruce Cornwell. 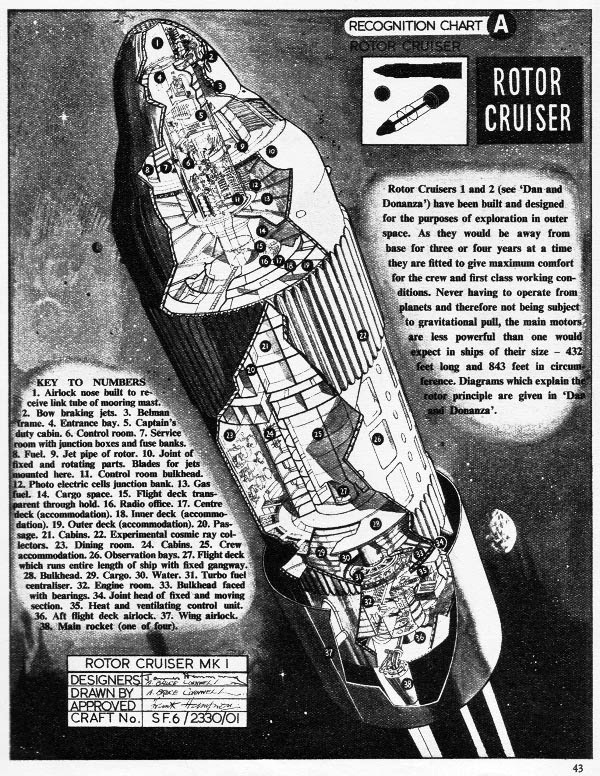 Bruce Cornwell’s earliest published Eagle cutaways were of the Rotor Cruiser and the Theron Duty Cutter for the 1953 Dan Dare Spacebook, not done in the coloured half centrespread style of the comic at the time but as highly detailed full page black and white images in keeping with the rest of the Space Book. 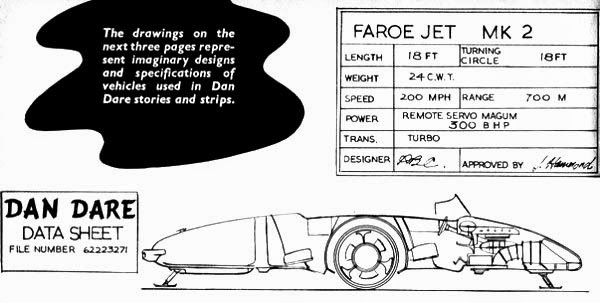 Ten years later he would also draw several more simplified cutaways as part of larger articles in the 1963 Dan Dare Space Annual with one, the Faroe Jet, signed with his ABC initials. 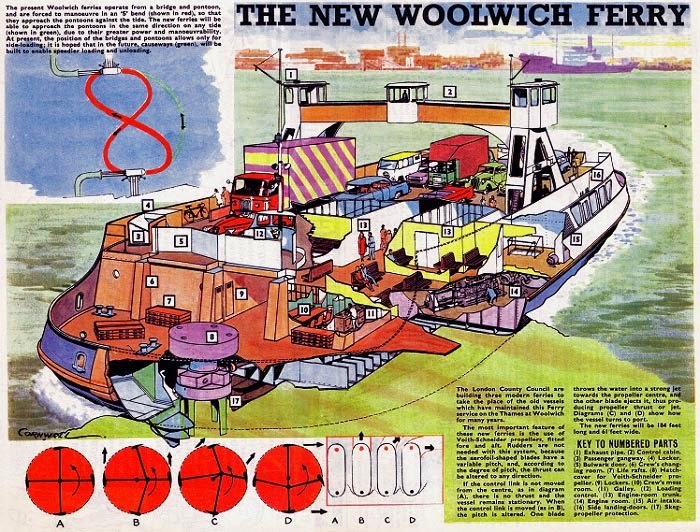 The first of these colour cutaways appeared in Eagle v11 #37 (dated 10 September 1960) and showed the passenger/cargo ship, RMS Windsor Castle, which was then used by its owners, Union Castle Line, to sail between England and South Africa. The ship had a relatively tall superstructure and funnel in comparison to its length and to help overcome this within the confines of the requirement for a long, narrow illustration, he buried the lower bow well into the sea and effectively off the page to allow more room for the height required. 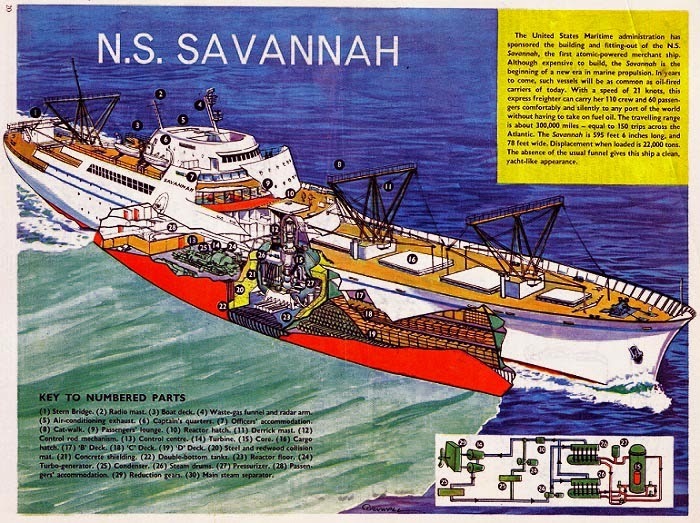 Bruce Cornwell’s final weekly Eagle cutaway was of the first of only four civilian nuclear powered cargo ships ever built, the NS Savannah. 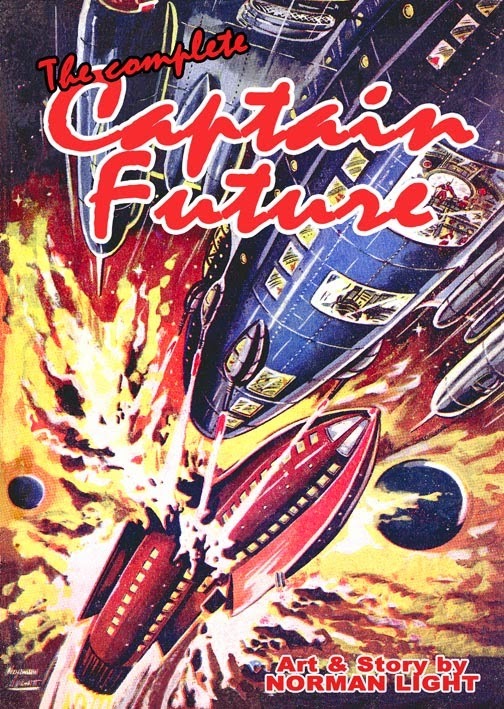 This ship was operated by the American State Marine Lines and the cutaway appeared in v13 #52 (29 December 1962). To modern eyes this is perhaps the most usual subject of the four cutaways but the Savannah was in service from 1962 until 1972 and still exists today berthed at Baltimore in the United States where she has been declared a Historic National Landmark. There are a few other cutaways by Bruce Cornwell associated with Eagle that are worth mentioning. In 1952 he illustrated a short factual series entitled Ships Through the Ages and, as part of the 16th And 17th Century Craft section of this in Eagle v3 #8 (30 May 1952) he presented the sectional cutaway of a high-sterned Elizabethan warship in a large, signed panel. 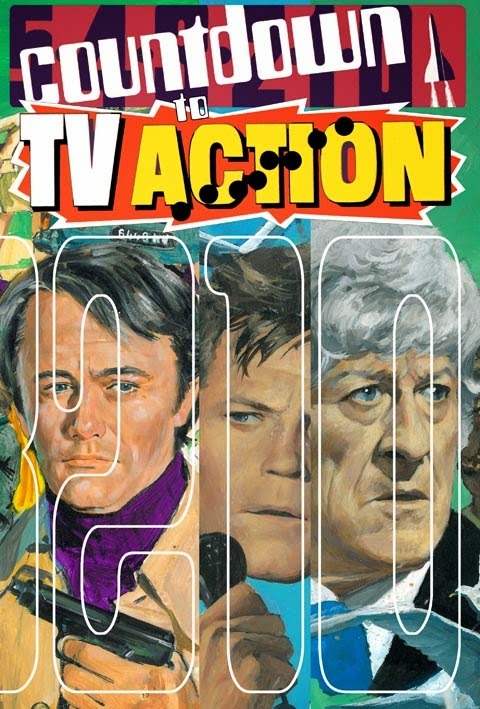 What happened to it was that it lay forgotten for decades until it was rediscovered and was finally published, along with a new key devised by Bruce himself listing its different sections, as the colour centrespread of Spaceship Away issue 22 in Autumn 2010. 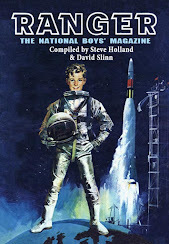 (I was fortunate to correspond with Bruce Cornwell for a year or so before he passed away on 2 March 2012 during which time he helped me in writing several articles on his non-Dan Dare work, articles that were written for Eagle Times, the journal of the Eagle Society. Bruce was generous with his time while his memory of events, people and his work from more than half a century beforehand was quite remarkable. 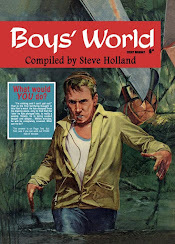 This article on his cutaway work was the last one I completed with his help. The original version of this article was published in Eagle Times v25 #1, Spring 2012). Click here for details and payment options. 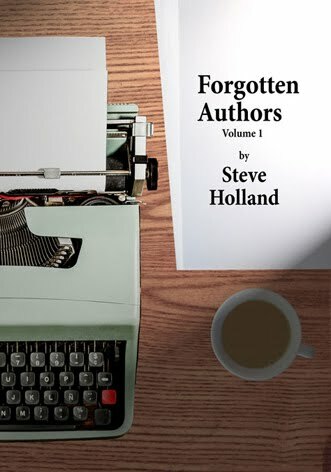 "Recommended for anyone with an interest in the history of books, book publishing, obscure authors or even researching family history. Looking forward to Volume 2"—Amazon review. 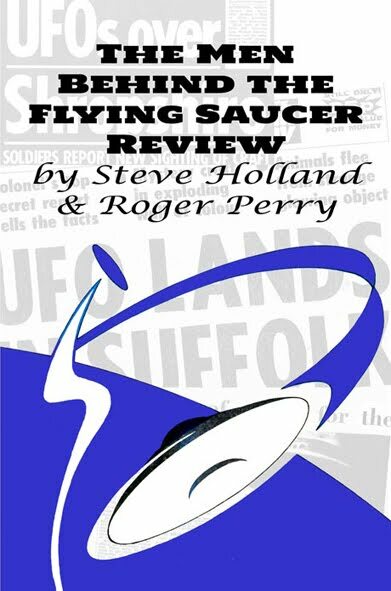 "Beginning in 1955, the Flying Saucer Review has been key to chronicling the appearance of Unidentified Flying Objects and the latest theories of why they have been appearing in our skies. 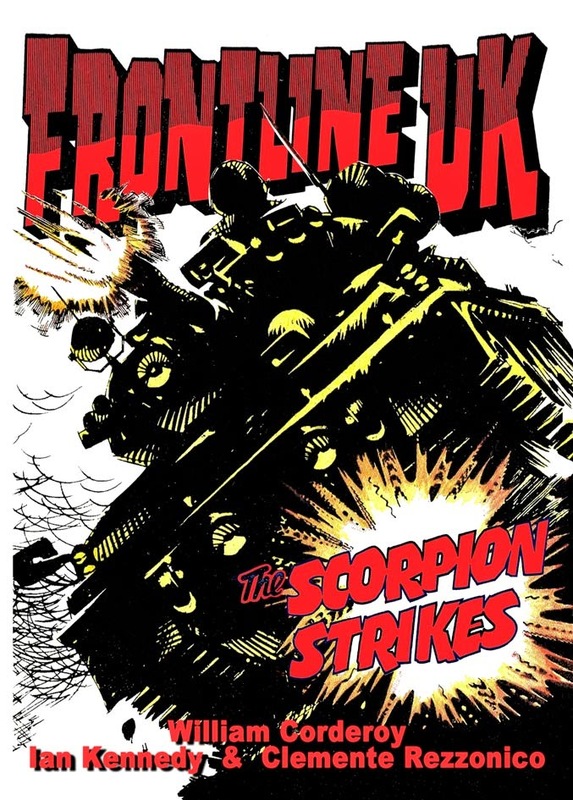 A dedicated group of enthusiasts - amongst them an accountant, a publisher's editor, a test pilot, a novelist and a member of the House of Lords - were amongst those who helped put together this remarkable magazine. Who they were and how they came to work together makes for a fascinating tale, some of it as curious as the phenomena the magazine studied." "The perfect compliment to my set of Countdown/TV Action" - Graham Bleathman. 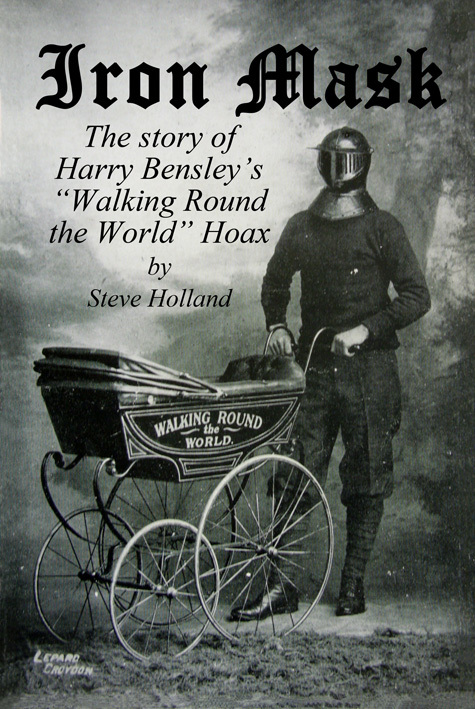 "The definitive history of the title" - Lew Stringer, Blimey! 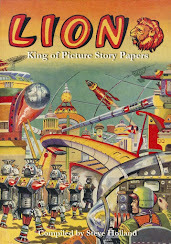 "It's a great read in itself and has sent me back to the Lion comic to re-read some of my childhood favourites. The pictures are reproduced crystal clearly and even this old man can read the original art ... It's a gorgeous book and if we are snow-bound as the media has been saying for weeks, I have plenty to keep me amused this chilly January weekend!" - Norman Boyd. 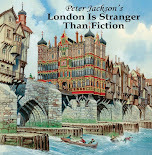 "Superb production and a treasured addition to the groaning bookshelf!" - Dave Gibbons. "If you've been meaning to give Sexton Blake's adventures a try, this would be a great place to start. I've seen the actual annuals go on Ebay for three or four hundred bucks, so this is definitely a bargain too." - Singular Points. 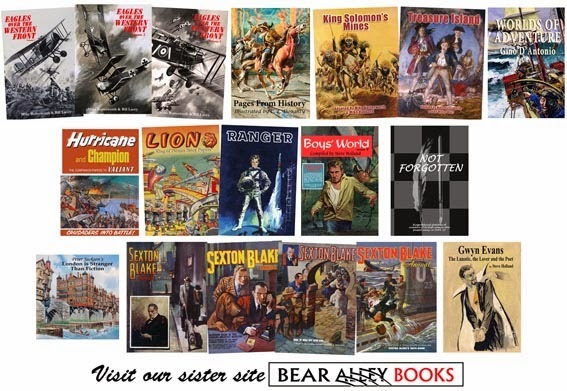 "The original books have been highly collectable for many years now, but finally they’ve been republished in a single volume from Bear Alley Books ... for the ridiculously reasonable price of £14.99. Do yourself a favour. " Christopher Fowler. Great News For All Readers! 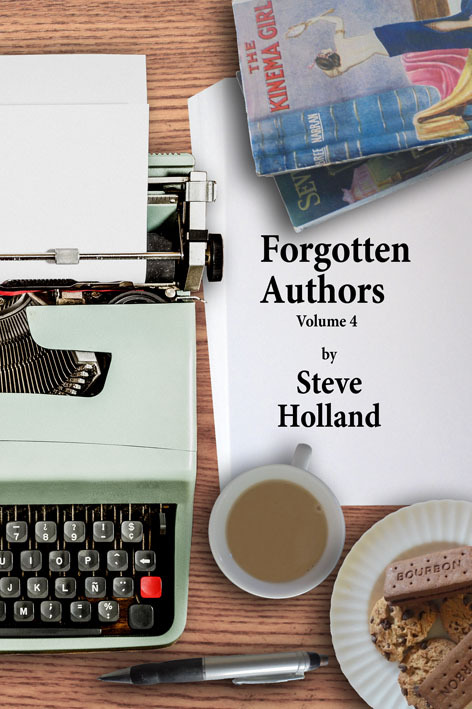 Bear Alley and Bear Alley Books are © 2006-2019 Steve Holland. The content of this blog may not be reproduced without permission.